The Asia Gardens Hotel is adjacent to two magnificent golf courses, which can be reached in just 3 minutes by car. 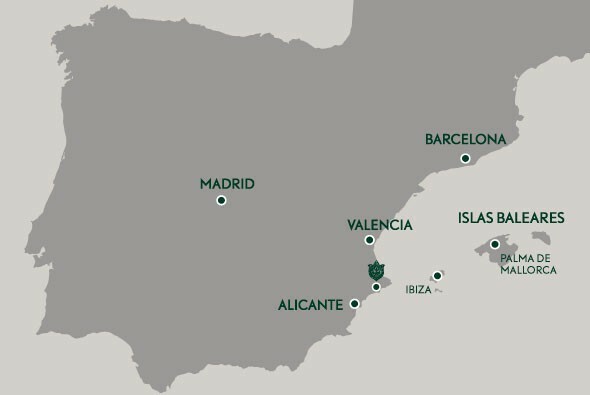 Both are 18-hole courses: Villaitana Levante and Poniente (East and West), and they have been designed and supervised by Jack Nicklaus (regarded by many as the greatest golfer of all time) through the prestigious firm Nicklaus Design, number one worldwide. The courses extend over gently undulating land without excessive complications in a privileged vantage point on the Costa Blanca. They have the features most in demand among golfers today, in that they provide both enjoyment and technical challenges along each of their impeccable courses. These courses also have a practice area (a 300-metre long driving range, with more than 30 posts on natural grass), a putting green area, an approach shot zone with two practice bunkers, club hire service (Ping and Callaway), buggies, manually and electrically operated caddies, a pro shop, a café in the club house, changing rooms and a golf school staffed by professionals certified by the Royal Spanish Golf Federation, which offers a broad range of individual and group classes as well as clinics for groups and corporate clients. Green Fee reservations can be made directly with our Public Relations Department where you can find out more about prices and availability. The hotel can provide a shuttle service to take you there and bring you back at any time. · Alicante Golf: Distance from the hotel: 35 km. Designer: Severiano Ballesteros. 18 holes. Par 72. Practice Course. · La Sella Golf: Distance from the hotel: 40 km. Designer: José María Olazabal. 18 holes. Par 72. Practice Course. · Bonalba Golf: Distance from the hotel: 30 km. Designer: Ramón Espinosa. 18 holes. Par 72. Practice Course. · El Plantío Golf: Distance from the hotel: 30 km. Designer: Manuel Ferri Ruiz. 18 holes. Par 72. Practice Course. · Alenda Golf. Distance from the hotel: 58 Km. Designer: Roland Favrat. 18 holes. Par 72. Practice Course.